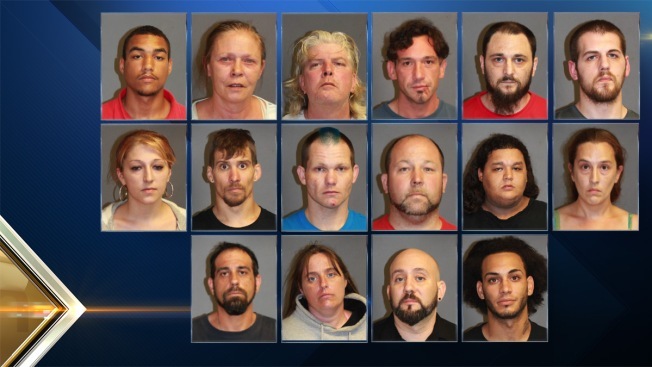 Nashua Police arrested 16 people during a drug sweep on Thursday. Police in Nashua, New Hampshire, arrested 16 people as part of a drug sweep on Thursday. Paul Anthony Williams, 22, of 1268 Hanover St., Manchester, on a charge of acts prohibited, sale of a controlled drug, cocaine. He was held on $25,000 cash bail pending his arraignment Friday. Jacqueline Disario, 54, of 123 West Pearl St., Apt. 213, Nashua, on three counts of acts prohibited, sale of a controlled drug, heroin. She was held on $5,000 cash or surety pending her arraignment on Friday. Patrick Michael Jordan, 44, of 12 Williams Ct., Nashua, on one count of acts prohibited, sale of a controlled drug, heroin, and one count of convicted felons, felon in possession of a dangerous weapon. He was held on $5,000 cash bail pending his arraignment on Friday. Justin Greenwood, 39, of 7 Caron Ave, Nashua, on one count of acts prohibited, sale of a controlled drug, Clonazepam. He was held on $5,000 cash bail pending his arraignment on Friday. Sean Rose, 34, of 166 Highland St., Apt. 2, Plymouth, on one count of acts prohibited, possession of a controlled drug, heroin. He was held on $2,000 cash bail pending his arraignment on Friday. Curtis Cawley, 28, no fixed address, Plymouth, on one count of acts prohibited, possession of a controlled drug with intent to sell, heroin, and acts prohibited, possession of a controlled drug, crack cocaine. He was found to be in possession of approximately 28 grams of heroin, which carries an enhanced penalty. He was held on $10,000 cash bail pending his arraignment on Friday. Kristin Rommel, 25, of 9 Abads Dr., Woodstock, on one count of acts prohibited, possession of a controlled drug, crack cocaine. She was held on $2,000 cash bail pending her arraignment on Friday. Adam Joyce, 31, of 24 Tie St. Apt. 24, Campton, on one count of acts prohibited, possession of a controlled drug, heroin. He was held on $2,000 cash bail pending his arraignment on Friday. Donald Jennings Jr., 30, of 15.5 Brook St., Nashua, on one count of acts prohibited, possession of a controlled drug with intent to distribute, methamphetamine, second offense, and one count acts prohibited, possession of a controlled drug, Fentanyl, second offense, breach of bail conditions, and an electronic bench warrant issued by Nashua District Court for non-appearance on three other drug charges. Jennings was found to be in possession of approximately 23 grams of methamphetamine, which carries an enhanced penalty. He was held on $25,000 cash bail pending his arraignment on Friday. Jason Levesque, 39, 17 Macdonald Dr., Nashua, on one count of acts prohibited, possession of a controlled drug, buprenorphine hydrochloride and naloxone hydrochloride, possession of a controlled drug, marijuana. He was released on $10,000 personal recognizance and will be arraigned on July 28. Jeremy Menendez, 26, of 102 East Hollis St., Apt. 2, Nashua, on two counts of acts prohibited, sale of a controlled drug, marijuana concentrate, second offense, and one count of criminal liability to acts prohibited, sale of a controlled drug, marijuana concentrate, second offense. He was held on $5,000 cash bail pending his arraignment on Friday. Jennifer Dion, 34, of 44 Tolles St., Nashua, on one count of acts prohibited, sale of a controlled drug, marijuana concentrate, second offense. She was held on $5,000 cash bail pending her arraignment on Friday. Michael Boucher, 40, of 46 Vine St., Nashua, on one count of possession of drugs in a motor vehicle, crack cocaine. He was held on $400 cash bail pending his arraignment on Friday. Tamara Batchelder, 34, of 48 Chestnut St., Apt. B, Nashua, on one count of acts prohibited, possession of a controlled drug, crack cocaine, and one count of acts prohibited, possession of a controlled drug, heroin. Her bail was set at $3,000 cash or surety bail pending her arraignment on Friday. Jeremy Franzen, 37, of 92 Ledge St., Nashua, on one count of driving after revocation or suspension, second offense, and an electronic bench warrant out of Merrimack District Court for non-appearance stemming from a charge for driving after revocation or suspension. He was released on personal recognizance bail and will be arraigned on July 14. Michael Roig, 25, of 95 Bowers St., Apt C, Nashua, NH, on two outstanding warrants. The first was issued by Manchester Police for domestic violence, and the second was issued by Nashua Police for theft by unauthorized taking. His bail was set at $7,000 cash or surety and he was scheduled to be arraigned on Friday.